If you’re preparing an Indian curry or Asian dish tonight, you may consider adding turmeric for a little extra flavor, some warm, yellow hues and a pinch of its cancer-fighting benefits. Turmeric is a deep yellow spice used for centuries in Asian countries, particularly China and India, mostly in cooking, and often as a fabric dye. But there is growing research into its medicinal properties, particularly the beneficial powers of curcumin, one of the most active compounds found in the spice. Historical evidence dating back thousands of years shows people in China and India often used curcumin to treat a number of conditions, from coughs and colds to skin diseases and wounds. Although it’s been touted for its anti-inflammatory and antioxidant properties, tests to confirm further medicinal properties over the last few decades show mixed results. But the popular spice is back in the limelight thanks to modern clinical trials evaluating the compound’s cancer-fighting properties. Many studies have shown curcumin can suppress tumor cells and is safe to consume even at high doses. The study on tissue samples showed how curcumin activates the specific protein that can slow or stop the growth of mesothelioma cells. A big challenge for researchers is finding ways to increase curcumin’s absorption into the body. The stomach doesn’t absorb as much of the compound when it’s ingested as a spice. Studies at the University of Michigan found combining curcumin with piperine, the active compound in black pepper, improves absorption into the body’s cells. Dowlati is confident curcumin clinical trials involving humans could begin before 2017. Turmeric can be found in most health food stores, as well as Indian and Asian markets. It is a root, much like ginger, which is part of the same family. You can purchase it powdered or fresh. Try both and decide which works best for you. You will find that its fresh form is extremely potent in color, so take care not to stain your counters or clothes. Turmeric has a mild, tangy flavor and can easily blend into plenty of dishes, unlike ginger, which is much stronger. It’s also available in pill form, but use the least processed kind. 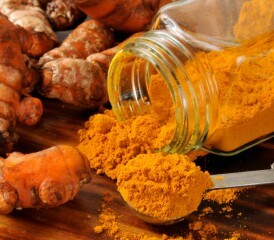 Fresh or powdered turmeric is a more potent source of curcumin. It’s cheaper, too. How Can You Use Turmeric? Grate or grind the fresh root into any juice, soup or smoothie. Mix 1 teaspoon of powder with a little honey and take daily as a supplement. Add to rice or curry dishes. Add a pinch to scrambled eggs. Boil with a little ginger and honey to make a tea. It’s great when you have a cold. Pickle turmeric by adding lemon juice and salt to peeled and chopped pieces of the fresh root. Keep refrigerated in a jar and eat a few pieces every day. Don’t forget: Adding in a little black pepper will help increase the absorption of curcumin. Search online for recipes under “golden milk,” which combine dairy or nondairy milk with turmeric, ginger, honey, vanilla and a pinch of black pepper for a truly power-packed beverage. Tejal Parekh is a registered and licensed dietitian in Florida with a master’s in nutrition and dietetics from Georgia State University. She realized her passion more than 10 years ago when she started working with cancer patients. Tejal also is one of the first dietitians in Florida to be board-certified as a specialist in oncology nutrition.